Berkeley — A bound pair of icy comets similar to the dirty snowballs circling outside the orbit of Neptune has been found lurking in the shadow of Jupiter. 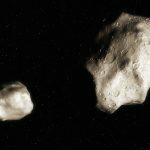 Astronomers at the University of California, Berkeley, working with colleagues in France and at the Keck Telescope in Hawaii, have calculated the density of a known binary asteroid system that shares Jupiter’s orbit, and concluded that Patroclus and its companion probably are composed mostly of water ice covered by a patina of dirt. Because dirty snowballs are thought to have formed in the outer reaches of the solar system, from which they are occasionally dislodged and end up looping closer to the sun as comets, the team suggests that the asteroid probably formed far from the sun. It most likely was captured in one of Jupiter’s Trojan points – two eddies where debris collects in Jupiter’s orbit – during a period when the inner solar system was intensely bombarded by comets, around 650 million years after the formation of the solar system. If confirmed, this could mean that many or most of the probably thousands of Jupiter’s Trojan asteroids are dirty snowballs that originated much farther from the sun and at the same time as the objects now occupying the Kuiper Belt. “It’s our suspicion that the Trojans are small Kuiper Belt objects,” said study leader Franck Marchis, a research astronomer at UC Berkeley. Marchis and colleagues from the Institut de Mécanique Céleste et Calculs d’Éphémérides (IMCCE) at the Observatoire de Paris and from the W. M. Keck Observatory report their findings in the Feb. 2 issue of Nature. The team’s conclusion adds support to a recent hypothesis about the evolution of the orbits of our solar system’s largest planets, Jupiter, Saturn, Uranus and Neptune, put forth by a group of researchers headed by Alessandro Morbidelli, a theoretical astronomer with the Conseil National de la Recherche Scientifique laboratory of the Observatoire de la Cote d’Azur, Nice, France. In a Nature paper earlier this year, Morbidelli and colleagues proposed that icy comets would have been captured in Jupiter’s Trojan points during the early history of the solar system. According to their scenario, during the first few hundred million years after the birth of the solar system, the large gas planets orbited closer to the sun, enveloped in a cloud of billions of large asteroids called planetesimals, perhaps 100 kilometers (62 miles) in diameter or less. Interactions with these planetesimals caused the large gaseous planets to migrate outward until about 3.9 billion years ago, when Jupiter and Saturn entered resonant orbits and began tossing the planetesimals around like confetti, some of them leaving the solar system for good. The bulk of the remaining planetesimals settled into orbits beyond Neptune – today’s Kuiper Belt and the source of short-period comets – but a small number were captured in the Trojan eddies of the giant planets, in particular Jupiter. Though Marchis refers to the scenario as “a nice story,” he admits that more work needs to be done to provide support for it. “We need to discover more binary Trojans and observe them to see if low density is a characteristic of all Trojans,” he said. Trojan asteroids are those caught in the so-called Lagrange points of Jupiter’s orbit, located the same distance from Jupiter as Jupiter is from the sun – 5 astronomical units, or 465 million miles. These points, one leading and the other trailing Jupiter, are places were the gravitational attraction of the sun and Jupiter are balanced, allowing debris to collect like dust bunnies in the corner of a room. Hundreds of asteroids have been discovered in the leading (L4) and trailing (L5) points, each orbiting around that point as if in an eddy. As experienced asteroid hunters, Marchis and his colleagues in August this year discovered the first triple asteroid system, 87 Sylvia, much closer to the sun in the main asteroid belt between Mars and Jupiter, and used a powerful 8-meter telescope of the European Southern Observatory’s Very Large Telescope in Chile to study the three objects. They were able to chart the orbits of the asteroids to estimate the density of Sylvia, from which they concluded it is a rubble-pile of loosely, packed rock. The laser guide star system uses a laser beam to excite sodium atoms within a small spot in the upper atmosphere. This artificial “star” is used to measure atmospheric turbulence, which is then removed by the movable mirrors of the Keck adaptive optics system. With the system providing an unparalleled 58 milliarcsecond resolution, the Keck team made five observations in the infrared between November 2004 and July 2005. Marchis and his colleagues determined that the density of Patroclus and its companion, which are about the same size and circle around their center of mass every 4.3 days at a distance of 680 kilometers (423 miles), was very low: 0.8 grams per cubic centimeter, about one third that of rock and light enough to float in water. Assuming a rocky composition similar to that of Jupiter’s moons Callisto and Ganymede, the components of the system would have to be very loosely packed – about half empty space, an internal characteristic which is not expected for a same-size binary system, the researchers concluded. Because in Homer’s Iliad, Patroclus was Achilles’ companion and a hero of the Trojan War, Achilles would have been an appropriate name for one of the two asteroids, which are about the same size. However, another asteroid already has the name Achilles, so Marchis and his collaborators proposed naming the smallest member of the binary system Menoetius, after the father of Patroclus. The Committee on Small Body Names of the International Astronomical Union has tentatively accepted the name. The asteroid designated Menoetius is about 112 kilometers (70 miles) in diameter, while Patroclus is about 122 kilometers (76 miles) wide. This work was partially supported by the National Science Foundation Science and Technology Center for Adaptive Optics, and managed by the University of California at Santa Cruz under cooperative agreement No. AST-9876783. This material is partly based upon work supported by theNational Aeronautics and Space Administration issue through the Science Mission Directorate Research and Analysis Programs. Most of the data were obtained at the W. M. Keck observatory, which is operated as a scientific partnership between the California Institute of Technology, the University of California and the National Aeronautics and Space Administration. The Observatory and its AO system were made possible by the generous financial support of the W. M. Keck Foundation. 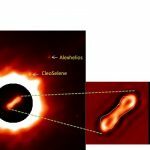 Additional observations were obtained at theGemini Observatory (acquired through the Gemini Science Archive), which is operated by the Association of Universities for Research in Astronomy, Inc., under a cooperative agreement with the NSF on behalf of the Gemini partnership. The authors wish to recognize and acknowledge the very significant cultural role and reverence that the summit of Mauna Kea has always had within the indigenous Hawaiian community. We are most fortunate to have the opportunity to conduct observations from this mountain. Fig.1: The asteroid 617 Patroclus and its companion are indicated by the green triangle in Jupiter’s trailing Lagrange point. The white dots indicate the position of the 10,000 known asteroids in our solar system with diameters greater than 10 kilometers. They cluster in the main asteroid belt between Mars and Jupiter, plus the two Lagrange points of Jupiter’s orbit.